"There is no system. There is only nature. to get ever closer to the nature of creativity." What brings you closer to creativity? 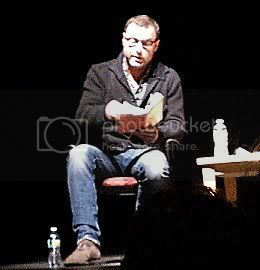 At last night's Yale Appearance, Liev gave his admirers what we've all been wanting: a peek behind the curtain at the machinations of the man as an artist. How does he get there? However, the next best thing is that I've heard from a girl who was there (Hi Rogue!). I've sent her a message asking for permission to post her account of the experience here. Until then, you'll have to suffer through my vicarious impressions. Rogue asked Liev a question to which he gave an enthusiastic answer. Again, I will let her tell you about it if she agrees to post here. We've always know that Liev was way beyond smart enough to understand a role and grasp its significance and impact on the project as a whole, no matter how much actual face-time he gets (Sum of All Fears, Repo Men, 100 Years, Painted Veil etc). We've seen his commitment, whether it's through intense preparation and study, (Everything is Illuminated, Woodstock, Defiance etc.) or just his generosity of spirit with a great desire for all projects to go well. It's pretty clear that for Liev this is not just a job. What I haven't seen is how he feels in a role; actually occupying it. What makes it hum for him? How does he crawl into the skin of Marty Kantrowitz with such peaceful conviction and then, later on, inhabit the gigantic presence that is Sabretooth with such unyielding power? We know he loves research and learning and knowing. But what about he himself. When does the Liev in Liev give over? According to my lovely and lucky source, he stands in front of a mirror at home and guzzles a glass of wine while toasting his Grandfather, Alex. Were you ready for that endearing image? Were you ready for that kind of intimate peek-a-boo? I was not - which made it that much more thrilling for me. There was some talk of stretching, toe-touching and other manoeuvres which bring the "gym" into kinesiology for me, but this single act is what I loved hearing the most. What this says to me is that Liev's goal in his work is to be honest. His dedication to the process comes from a place of honour and integrity - and those virtues were bestowed upon him by his Grandfather. I'm sure Alex was watching the whole thing last night - a Great Spirit up there embibing his "spirits" and beaming with pride at the Grandson who pays homage to him and conjures up all the good before going out and doing them both proud. "What this says to me is that Liev's goal in his work is to be honest." And I too felt quite taken aback that he opened up. I felt privileged and by god, I really had to hold myself back from walking over and hugging him to pieces lol It was definitely a wonderful event that I will cherish lovingly! It's nice that he will open up, and just be honest and genuine! It fully conveys the depth of his own character, as well as the ones he plays on stage and on screen! Oi! You calling me a character?! I'm an interesting personage to YOU? Do I look like I read books?! Am I hear to entertain you?! Did you already read the PM I sent you? A klog iz mir! So, I should sit here on my tuches and wait for you to kibbitze around until you read your PM and figure it out??? Oy. Are you meshugeh? Hey! Don't you Yiddish me! I know what all that means...I might be a shiksa, but I know the lingo~!